JAKARTA, Indonesia (AP) — Bombs have exploded at the Ritz-Carlton and Marriott hotels in the Indonesian capital on Friday, ripping the facade off the Ritz. Police say at least four people are injured. 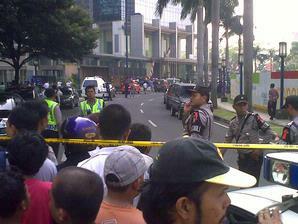 Debris and shattered glass littered the street outside the neighboring hotels in an upscale Jakarta neighborhood. Ambulances were being shuttled into the area. Via New York Times, Foto dari harian Kompas. Update 1 : Perkembangan beritanya cepat sekali. Ada isu ledakan berasal dari Genset meski kemungkinannya kecil jika melihat korban yang ada. Posted by vavai on Jul 17th, 2009 and is filed under Berita. You can follow any responses to this entry through the RSS 2.0 feed. You can leave a response, or trackback from your own site. terakhir ditemukan bom di kamar 1808 dan sdh dijinakan oleh petugas..
Mengungkap dengan tuntas kasus2 bom di negeri kita tercinta ini. Aparat intelejen adalah kelompok terdepan yg tdk mampu melakukan tindakan preventif.